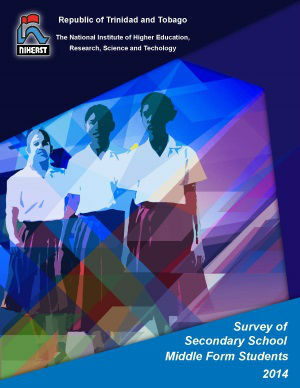 In this publication, the National Institute of Higher Education, Research, Science and Technology (NIHERST) presents the results of the Survey of Secondary School Middle Form Students, 2014. This study originated from NIHERST’s participation in the Action Plan of Panama 2012-2016, OAS Working Group 2 which focuses on Human Resources, Training and Education. The Survey of Secondary School Middle Form Students, 2014 was an enquiry of form three students (middle form students) in government, government-assisted and private secondary schools. The study focused on form three students because at this juncture of secondary education students usually select appropriate C.S.E.C. subjects which impact their future career choices. The major objective of this study was to compile benchmark data on students such as their desire to further their studies, factors that influence students’ decision to study, their opinion and choice of scientific careers, and reasons for pursuing/not pursuing careers in science and technology (S&T). It also examined students’ attitudes towards S&T and activities performed in science and mathematics classes. The results are intended to assist decision-makers, researchers, teaching personnel and, in general, stakeholders in science education and communication. Of the total sample of 5626 of form 3 students who participated in the survey, 55% were females and 45% were males. A review of the data by type of school shows an equal distribution of males and females in government-assisted and private schools while females (59%) out-numbered their male counterparts (41%) in the government schools. The modal age of form 3 students was 14 years (53%) while 30% were 15 years of age. By type of school, a larger proportion (65%) of students in government-assisted schools were 14 years of age compared to their counterparts in government (47%) and private (52%) schools. The most popular subject amongst the form 3 students was Mathematics (21%) followed by English Language (11%) and Integrated Science (10%). Mathematics (21%) was the most popular subject amongst males followed by Integrated Science (10%), English Language (8%), IT (7%) and Physics (6%) while female students preferred Mathematics (21%) followed by English Language (13%), Integrated Science (11%), Social Studies (6%) and Visual Arts (6%). The majority of students cited interest as the main reason they preferred a subject except in the case of Mathematics where the majority (49%) indicated that it was challenging while one-third (34%) found it interesting. The least preferred subject amongst the form 3 students was Spanish (25%) followed by Mathematics (17%). This pattern of responses was observed amongst all ages, gender and type of school. Difficulty and boredom to a lesser extent were identified as the main reasons subjects taught in form 3 of secondary schools were considered least preferred. Over a half of the students showed a lack of preference for Mathematics (73%), Integrated Science (66%), Chemistry (62%), Spanish (60%), Physics (55%) and Technical Drawing (54%) mostly because these subjects were too difficult. A substantial proportion of students who preferred English Language, Literature and the Social Sciences the least stated that the subjects were boring. A significant majority (88%) of the sample of form 3 students expressed a desire to further their education after secondary school. By gender, a relatively larger proportion (92%) among females was desirous of furthering their education compared to males (83%). Of the students who expressed a desire to further their education, a substantial percentage (40%), especially females (50%), indicated that they would study Social Sciences and Humanities while 20% and 13% selected Natural Sciences, and Engineering and Technology respectively. Social Sciences and Humanities (27%) were also the most popular fields of study amongst male students followed by Engineering and Technology (23%) and Natural Sciences (22%). Two-thirds and more of the students stated that the ability to earn money (70%), getting a job (68%) and focusing on what they like doing and pursuing a fulfilling career (66%), greatly influenced their decision to further their studies. The factors that least influenced students decision to further their studies were a desire to construct buildings, bridges and tools (43%), invent technology (computers and programmes) (35%) and friends’ opinion (30%). Students who did not wish to further their studies after secondary school identified that secondary education was sufficient (34%), having to work right after school (26%), and a lack of interest (25%) as factors that greatly influenced their decision. A review of data of students desirous of furthering their education by their choice of profession shows that a higher percentage (28%) of students, mainly among males (47%), selected engineering while 26%, especially females (32%), wanted to become doctors. One-third (33%) of the students were not interested in either of these professions as a scientific career. A substantially larger proportion of the females (39%) expressed this view compared to their male counterparts (24%). Over a half of the form 3 students indicated that a scientist's job most likely entailed observation and laboratory experiments (70%); was well paid (67%); used theory and mathematics (55%); demanded specialised training (54%); and was creative and challenging (53%). A half (50%) of the sample of form 3 students was of the opinion that a scientific career attracted the youths of their generation while a quarter (24%) disagreed and a similar percentage did not know (25%). A substantial percentage of the sample of students agreed that science and technology (S&T) made their lives easier and more comfortable (71%), and also provided more job opportunities for future generations (50%). Over a quarter of the students disagreed that S&T contributed to job losses (27%), and would eliminate poverty and hunger globally (27%). In general, over a half (57%) of the students were of the opinion that S&T brought many benefits while a quarter (25%) believed it brought some benefits. One-third (32%) of the students were of the opinion that S&T brought some risks while 28% and 20% indicated that it brought many risks and few risks respectively; a negligible 2% believed that it brought no risk. One-third of the sample of form 3 students stated that outside of school hours they always looked at nature or animal life programmes or television documentaries (33%); visited zoos and botanical gardens (32%); and watched movies or read books and/or magazines (comic strips, comics, etc.) on science fiction (30%) while a quarter (24%) always used the Internet to find scientific information. A large proportion of students never listened to radio programmes on S&T (47%); participated in science fairs, clubs and Olympiads (45%); read scientific news in the daily papers (43%) or read science magazines (43%). An assessment of the performance of the sample of form 3 students in various subjects for the last academic year showed that over a half of the students who studied English Language (57%), Art (55%) and IT (53%) indicated a 4 or 5 rating on the Likert scale. One-fifth (21%) of the students stated that they performed excellent (5) in Mathematics while 23% and 27% assigned ratings of 4 and 3 respectively. With regards to the natural sciences, students stated that they performed relatively better in Biology with 47% assigning scores of 4 and 5 compared to Chemistry (42%) and Physics (40%). Students' performance rating in natural sciences was comparable to social sciences. A half or more of the form 3 students who participated in the survey agreed with the following statements on mathematics and science subjects: the majority of students could understand science topics if they were well explained (59%); mathematics and science made students think about how to better care for their health (57%); they were interesting (55%); they made them think about how to better care for the environment (51%); and they helped to clarify which profession to pursue in the future (50%). One-third (31%) of the students were neutral to the statement that school's science subjects were easy. A half (50%) of the students used computers frequently in their mathematics and science classes. In addition, 30% and more of the students also assigned a combined rating of 4 and 5 on the Likert scale to: view film projections (35%); use laboratories (33%); conduct experiments (32%); and use the library (30%). Students were asked to rate the importance of various activities in their mathematics and science classes. A substantial percentage of students stated that using computers (55%), conducting experiments (51%) and laboratories (51%) were important activities in their mathematics and science classes. Three-fifths of the students had relatives or close friends who were doctors (61%) and engineers (61%). A smaller proportion of students had relatives or close friends who were scientists (16%) and science professors (14%). One-third (32%) of the parents of form 3 students in all schools attained secondary education as their highest level of educational attainment. Thirty percent (30%) of the parents had achieved tertiary education, especially parents of students in state-assisted schools where two-fifths of the fathers (39%) and mothers (40%) attained this level of education. In general, the majority of form 3 students indicated that their houses possessed most of the essential household items. With respect to ICT, a significant percentage of the students stated that their households had a laptop/notebook (87%), Internet connection (79%) and desktop computer (72%).